Germany’s invasion of Poland in September 1939 again brought Europe into the conflict that the First World War was fought to end. The draconian terms of the Treaty of Versailles were intolerable to the German people. With his rise to power in January 1933, Chancellor Adolf Hitler began to re-arm the German military. In quick succession he re-occupied the Rhineland, merged Austria into a Greater German Reich, and occupied Czech Sudetenland, and then the remainder of Czechoslovakia. Poland’s large but outdated army was destroyed by rapid, armored column movements that later became known as Blitzkrieg. Even before the fighting in Poland had ended, the emboldened dictator directed his military to prepare a plan for the invasion of France. 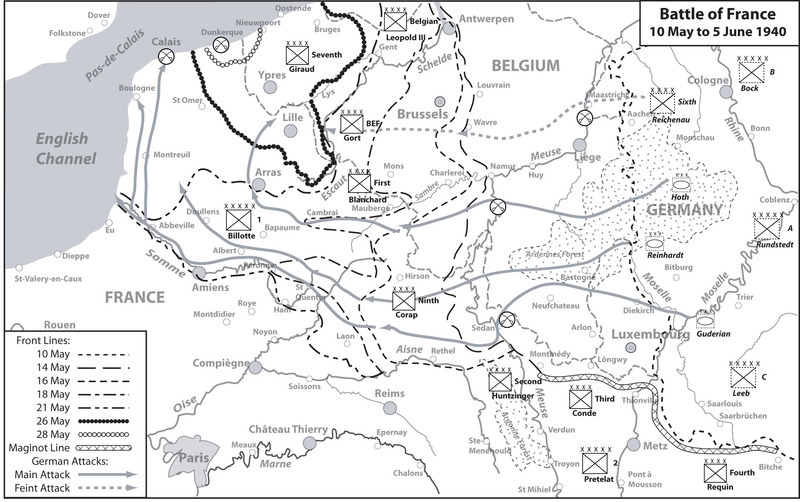 Fall Gelb (Case Yellow), the German General Staff’s original plan for the invasion of France, copied the essentials of the 1914 Schlieffen Plan: a massive thrust through northern Belgium and Holland followed by a sweep down into France toward Paris. Generalleutnant Erich von Manstein proposed a reversal of emphasis that became Operation ‘Sichelschnitt’ (cut of the sickle). He convinced Hitler that a strong armored force could sweep through southern Belgium and across northern France to the English Channel, cutting off the British Expeditionary Force (BEF) and major units of the French Army from their supply and communications. The plan included many additions, some of Hitler’s own creation, to convince the Allies of Germany’s intentions to make the main effort in the north. Specially trained airborne forces captured the Belgian fortress of Eben-Emael, which guarded the Albert Canal and the Maastricht appendix. Generalfeldmarschall Hermann Goering’s Luftwaffe initially targeted Holland, wiping out the Dutch Airforce on the first day and dropping airborne troops to capture bridges across key waterways. Stuka dive bombers, sirens blaring while they dove upon targets, destroyed allied planes still on the ground and intercepted troop movements. Bombers laid waste to cities to terrorize civilians, and Messerschmidt 109 fighters provided air cover for the German columns of vehicles and marching men. Belgian and Dutch military planning relied upon their forces executing a fighting retreat toward their population centers while the French and British advanced in support. The French trusted that the Maginot Line - a system of underground, concrete defensive installations lining the French-German border - was too strong for the Germans to consider attacking. After the fortuitous capture of German military plans on 10 January, commander of the French General Staff général Maurice Gamelin was convinced of the German intention to replicate the First World War’s Schlieffen Plan. He instituted the Dyle-Breda defensive plan, which would bring the best units of the allied armies forward into Belgium upon the outbreak of the fighting to face the German invasion along the Dyle River-Gembloux Gap-Meuse River line. The French did not intend to fight a second war on French soil. With the transmission of the code word ‘Danzig,’ the invasion of Belgium, Luxembourg, Holland, and France started at 05:30 German time (04:30 French time) on 10 May. The German plan of attack was as daring in execution as it was thorough in its planning. To the north Generaloberst Fedor von Bock’s Army Group ‘B’ was to appear to be the main assault group. Along the German-French border, Army Group ‘C’ was to pressure the Maginot Line and keep French defensive units from reinforcing other areas. Meanwhile, the real assault by Generaloberst Gerd von Rundstedt’s Army Group ‘A’ was to pass through the Ardennes Forest with the intent of crossing the Meuse River before French Ninth Army commanded by général André-Georges Corap and French Second Army led by général Charles Huntziger could complete their defensive preparations. For this critical action, seven out of Germany’s ten panzer (armored) divisions had been concentrated into three panzer corps. The principle force was on the southern flank, where General of Panzertruppen Heinz Guderian’s XIX Panzer Corps targeted Sedan. On the northern flank General der Infanterie Hermann Hoth’s two panzer divisions aimed at Dinant. XXXXI Panzer Corps, led by Generalleutnant Georg-Hans Reinhardt, was in the middle at Monthermé. The Luftwaffe provided massive air cover to shield the troops’ movements from enemy eyes. The German plan worked better than its military command expected. With the successful crossings of the Meuse on 13 May, the panzer divisions cut between the Maginot and Dyle Lines and headed for the English Channel. Allied responses were badly coordinated and usually late. On 15 May, the Dutch government surrendered, fearing additional bombings such as those that had destroyed Rotterdam. The German advance was so rapid that the execution of the Dyle-Breda Plan became impossible. On 20 May, the first panzer units reached the sea at Noyelles. In ten days they had accomplished what the Kaiser had not been able to do in four years. The cream of the French Army and the BEF were cut off; they were isolated and under attack from front, flank, and rear. On 28 May, the Belgian Army considered the situation hopeless and surrendered. The Belgian government continued functioning in London. Attempts by the confused and exhausted troops to break out of the encirclement failed, and changes in senior command of the French Army added to the confusion. With the last British-held channel port within sight and remnants of the allied armies fighting doomed delaying actions, Hitler issued his famous ‘Halt Order.’ The British Navy, commandeering hundreds of private craft, launched the war’s greatest sea rescue, evacuating 338,226 troops from the beaches of Dunkerque but abandoning their vehicles and equipment.